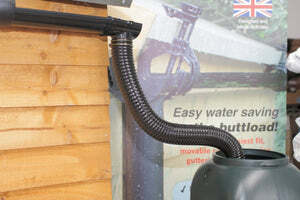 Hall's clip-on shed guttering kit – Freeflush Rainwater Harvesting Ltd. 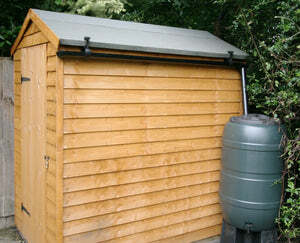 The Hall's Rainsaver is a simple but effective British invention that simplifies collecting rainwater from just about any sloping surface in a garden or allotment. 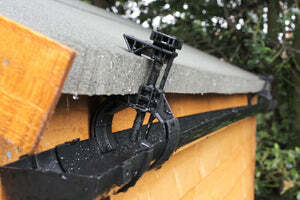 With this versatile system conventional guttering can be attached to sheds, summer houses, greenhouses, lean-tos, car ports etc. 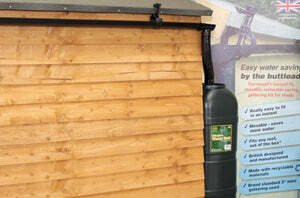 practically anywhere – clamps up to 3” depth fascias. No drilling or screwing into the building is needed, so building warranties are preserved and the system can easily be moved e.g. for painting or transfer to a new building. Designed and manufactured entirely in England from weather resistant recyclable materials and guaranteed for 5 years, the kit includes everything (except the water container): rainsaver brackets, quality branded 75mm guttering, connections where appropriate, outlet and 1m downpipe. Kits are available in various lengths, and a flexible downpipe version permits piping of rainwater easily around corners etc. 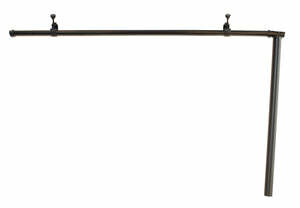 Universal - the bracket will fit roof edges up to a maximum clamping depth of 76mm (3″) and gutter rotation allows for pitch variations. The minimum clamping depth is 8mm (1/3”), but a suitable packing material may be used to reduce this to 0mm.